Come browse 3,000 sq. ft of treasures at this premier antique store in southwest Colorado. A great stock of antique furniture , paintings, and decor. Unique Steampunk and victorian-inspired clothing, mini top- hats, goggles and guns. 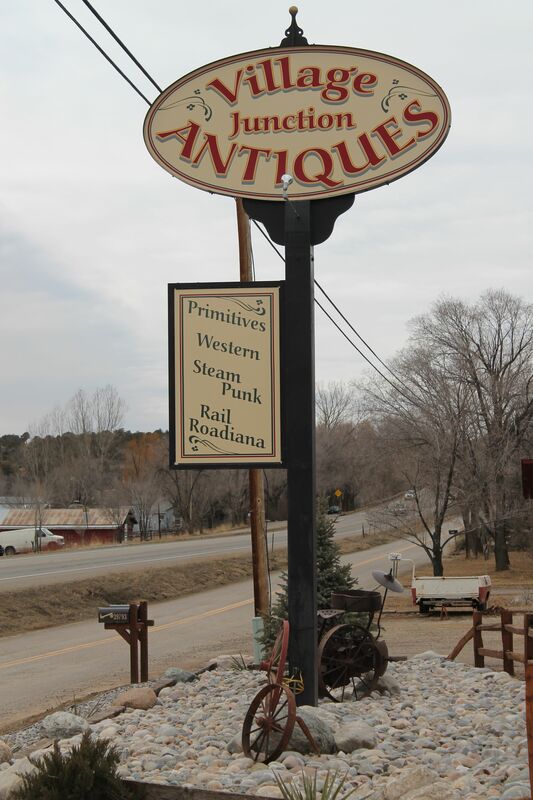 Located 2 miles west of Bayfield, and 20 minutes from Durango, on Hwy 160, at the "junction" of Gem Village, this building has been part of Gem Village history for many years serving as a gas station, convenience store and clothing store. Now it has a new look, new owners and a great new enthusiasm. The Stewart brothers (Steve and Lyle) have been life-long collectors and now have (painfully!!) opened their barn doors to stock this 3,000 sq ft venue. The Stewart sisters, Crystal and Candace, hand sew and repurpose beautiful steampunk and victorian-inspired clothing and hand craft victorian hats and steampunk goggles. The floor is constantly stocked with new items, you will want to come back again and again!